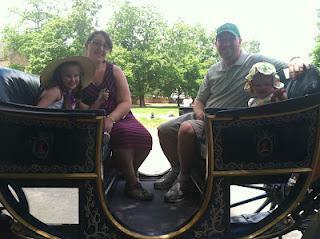 Last week we took a family vacation to Colonial Williamsburg - what fun we had!! Our 4 year old is very interested in history and had a blast watching the demonstrations and touring the old houses and jail. Of everything there to look at and do, all Madailein wanted was a straw bonnet and to take a horse ride! I was hoping to see some crafty demonstrations, but no such luck on the day we were there! We did get to see how they make wooden barrels - which looked super difficult! This month should be a bit more calm and I'm going to go into this month with optimism to get tons of crafting done!! June Crafting Goal #1 - the silk flower collage painting I've been wanting to do the past few months. June Crafting Goal #2 - paint another tree in Madailein's room to finish out her super cute Owl Bedroom. June Crafting Goal #4 - drip-painting terra cotta pots. 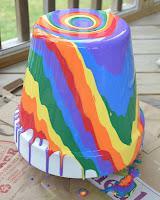 I came across this really cute project at http://inlieuofpreschool.blogspot.com/2012/05/something-borrowed-rainbow-pour.html and fell in love!! Cannot wait to try this one! Have you tried any new projects lately? What are your goals for June?